Léon Bakst was born in 1866 in Hrodna (Grodno, now Belarus) and studied at the St. Petersburg Academy and then in Paris at the Académie Julian, beginning his career as a magazine illustrator. After travelling through Europe, he returned to St Petersburg, where his portraits and book designs brought him early success. In 1898, together with Alexandre Benois and Serge Diaghilev, he founded the World of Art group. In 1906 Bakst became a teacher of drawing in Yelizaveta Zvantseva's private art school where, among other students, he taught Chagall. 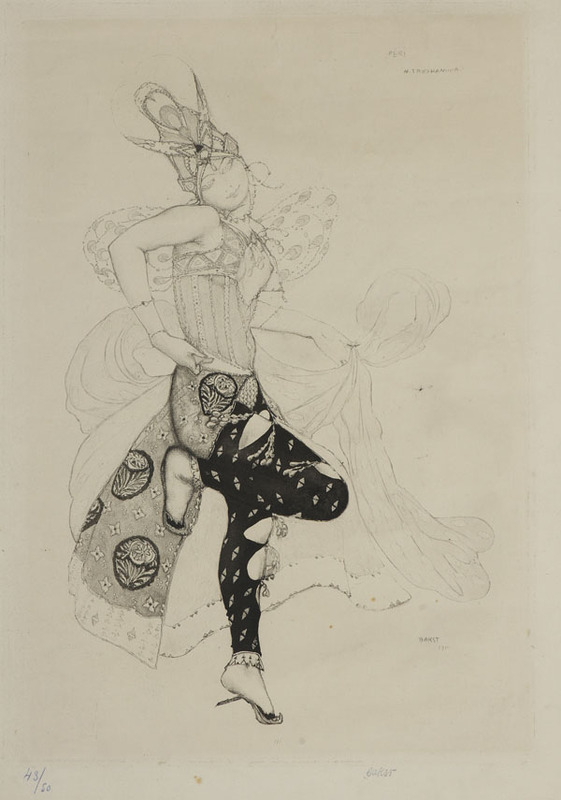 Rebelling against the dull and literal stage realism of the previous century, Bakst and Benois turned their painting skills to theatre design and in 1909 Bakst began his collaboration with Diaghilev, which resulted in the founding of the revolutionary Ballets Russes, of which he became artistic director. His stage designs quickly brought him international fame. Most notable are his costume designs for The Firebird and Sheherazade (both 1910) and L'Apres-midi d'un Faune (1912). In 1910 Bakst was exiled from St Petersburg (as a Jew without a residence permit) and settled in Paris, where he also worked for Ida Rubinstein’s ballet company. He died in Paris in 1924.